Only 1 left in stock - Order today! 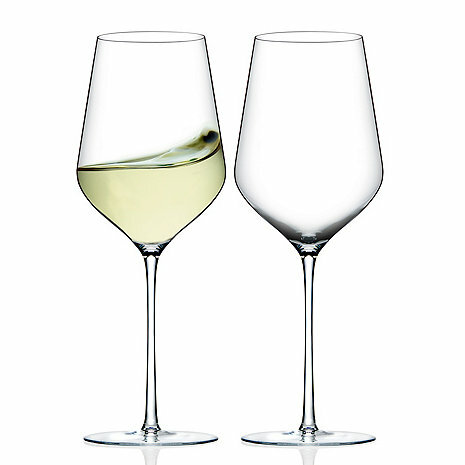 Zenology is peace of mind knowing that you're buying some of the highest-end stemware in the world at half the price. Brilliantly lightweight and elegant, Zenology glasses are handcrafted and mouth-blown in the same European factories as other well-known brands. Designed exclusively for Wine Enthusiast, we've erased the usual high-end luxury brand markup and passed the savings on to you. That's Zenology! In the unlikely event your ZENOLOGY Glass breaks, we'll replace it FREE, even up to 10 years after purchase! Click here for details. Do you ship to the United Kingdom? BEST ANSWER: Wine Enthusiast has partnered with Bongo International to service our international customers. Select the items you want to order, add them to your shopping cart, then select “Checkout". At the Sign In page, click on the button that reads “International Checkout“ and Bongo International will manage your order from that point on. I give this glass 5 stars. This glass pushes the boundaries of thin,fine and sturdy combo. It really enhances a fine wine experience. I have been drinking fine wine for 15 years or so. I am my own expert:) the zenology universal wine glasses are special. Very impressive great job?? Very satisfied with purchase of Zenology Universal wine glasses. I have a multitude of various wine glasses for different varietals of grapes. They are very nice to use tackling those varietals. For those times that I will be traversing between white and red as well as blends and offbeat varietals these work great! And sometimes you just want to worry about the wine and not so much the shape of the glass. These have a great general bowl and nice rim size. I had a pair of Zalto Universal glasses and broke one. I decided to try the Zenology glasses as they are much less expensive than the Zaltos. The Zenologies are OK but the two that came are different sizes and shapes. The quality control in their manufacture should be improved. I bought these because the base is smaller than other fine stemware and they would fit in my wine rack inside a cabinet. Shocked how delicate and beautiful these are. Same feel as my Zalto bourdeux glass, exact same height, but smaller and easier to handle. A very nice glass. Welll done ! Lovely glasses. I wanted Zaltos but they’re a little out of my budget. I’m a little fussy with wine glasses but these have the same elegance and delicateness but for a fraction of the price! Need to get more! Thank you for making beautiful, affordable glassware! I still really like these glasses, but they have changed since I first bought them about a year ago. I noticed right away that the stem is a little thicker; when I weighed the older and the new glasses, I confirmed it - the new one is 1/2 oz heavier than the old one. I also bought a couple more of the cab sauv glasses, which are also heavier. I'm guessing that they decided to make them a little sturdier, which makes sense to me. I bought these "replacements" since I had broken a few while washing/drying them. Even though I was careful, they did break rather easily. I learned to be VERY careful! Hopefully the changes they made will make the glasses a little easier to care for. Still great glasses - really enjoy using them! I had been using glass wine glasses, and became convinced of the significant difference god crystal can make for the tasting experience after being given a Zalto. I didn’t want to invest quite that much in an entire set for guests, but instead found Zenology. These glasses have the same thin construction and flexibility as the Zalto, with a slightly different bowl and foot shape. They are gorgeous on the table and enhance every wine. They are a bargain for the quality. If you are looking for wine glass perfection, look no further. Yes, they are delicate and need to be properly handled but, that's what makes them pure perfection. These wine glasses are the real deal! If you love wine and the experience that goes along with drinking it, then you will love them as much as I do. They are light, airy, and beautifully crafted. I feel like a princess when I drink from them! We loved the Zalto glasses but have broken 5 of the 8 we purchased :( -- too fragile. The Zenology universal glasses are terrific -- elegant but much more sturdy. We use them for whites and reds when we are drinking casually. To entertain I'd like a larger cab glass, but I really dislike the Zenology Cab glass -- too tall for the design. I think a better design would be to make them wider, and not so tall. The glasses were light, and elegant, But they are way too fragile. I broke 3 out of the 6 I bought on my first use. A couple just washing(by hand). The other just bumping it to another glass. The glasses are very light weight and seem very fragile.